← Good News! We’re all “SAVED” Now, Thanks To Obama. Moral Mondays have vacated the NC General Assembly grounds in search of a new venue to whine to and whine they did – or rather sing. Singing, I use that term loosely here, is what took up the bulk of the rally. Perhaps they were lacking in the speaker department. They did manage to dig up a gentleman named Bacilio Castro who spoke only Spanish and had to have his speech translated. Funny thing, I think I’ve seen him before at another event and he spoke English then. By the way, one of the speakers was Mark Case. Mark is the President of the Western North Carolina Labor Council (WNCLC). You know the WNCLC better as the AFL-CIO. Wouldn’t be too hard for Case to round-up a bunch of folks to attend a rally he was speaking at, now would it? The WNCLC is located at 45 Sardis Road, Asheville, NC 28806. That’s just a hop, skip and 8 mile jump away. This is a shot of the venue the rally was held at, Pack Square Park. 10,000? Pardon me for a moment but… HA HA HA HA HA HA!!! You’ll excuse me if I’m skeptical. After all, they held a dozen of these things in Raleigh and the largest they had there was 3,500-ish. 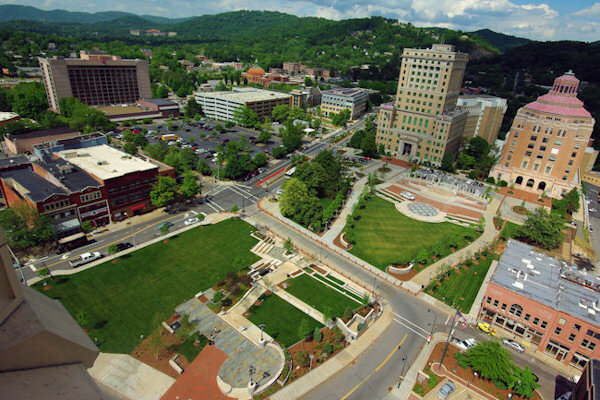 The Citizen Times of Asheville originally estimated 5,000. 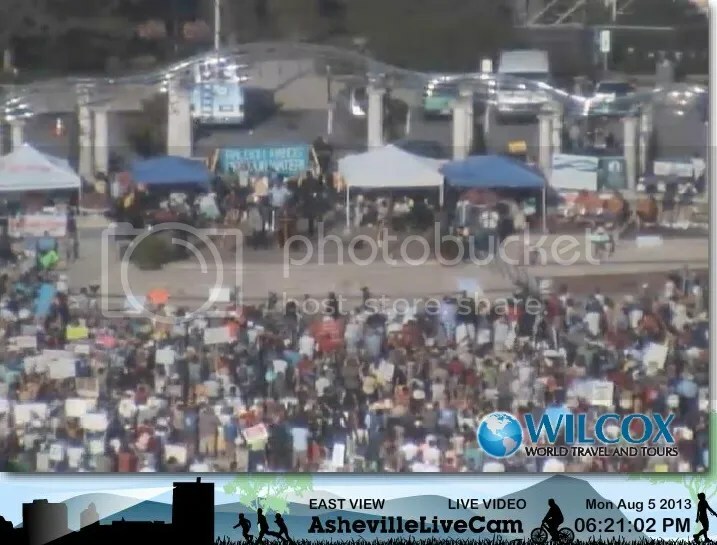 WLOS weighed in with 6,500 and the over-used intro of ‘biggest crowd ever’. I have a call in to the Asheville Police department to confirm this. I will update when I get the reply. UPDATE: APD said they told media ‘somewhere between 5,500 and 6,500’. Media ran with 6,500. WLOS’ story also repeated the incorrect 170,000 unemployment figure. Over-exaggeration of crowd size by attendees is pretty common and I noted as much in the July 29th edition. For what it’s worth, the Citizens Times of Asheville did not disclose they had a reporter of theirs who participated followed protesters in a past Moral Monday held June 24th. Hey, that’s activist journalism these days, right? There’s more slobbering of liberal local media with a 5 page article at the Black Mountain News. 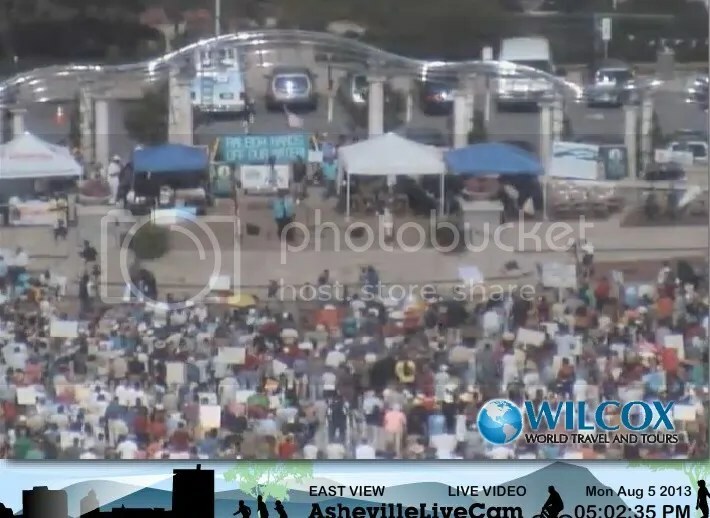 I decided not to count on local media or the typical over-zealous Moral Monday tweeters and found an active webcam of the park. Funnily enough, the crowd didn’t look like 10,000 for the hour and a half or so I took screen shots off. I began around 5pm and ended around 6:18ish. The crowd level really didn’t change much at all. The webcam handily had a running clock on it, so I kept it in the screenshots as verification. You can view the entire slide show of screenshots with multiple angles of the venue here. More Articles on ‘Moral Monday from LL1885 here. Thank you to Carolina Plott Hound for linking! This entry was posted in Err What?, LL1885, Moral Monday, New Civility, POLITICS NC, Social Justice, The Articles, THE LEFT, Unions and tagged Asheville, MoMoMo, Moral Monday, Mountain Moral Monday, NAACP, WNCLC - AFL-CIO. Bookmark the permalink. VIDEO: Moral Monday protestors sign fake petition to bring education spending back to most recent Democratic levels; thereby reducing IT by $500 million. I think they count their shadows, three more glorious years of this. I predict the crowds get thinner and Barber doesn’t.